These pages are an attempt to list all concerts of Bodine through the years. And why NOT? It's been done before! The example was set by Nigel Young, who covered nearly 40 years of Ian Gillan's stage career! Only we think gigology sounds better! 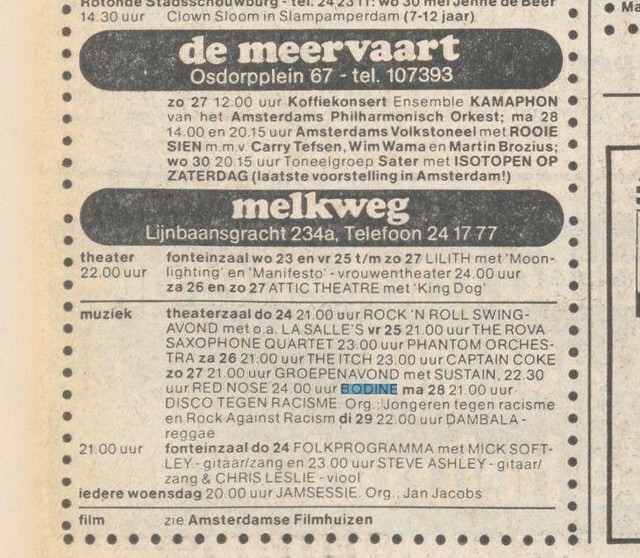 A great deal of thanks to these pages are dedicated to Shockpower and Martin Stassen, who went through piles of old magazines (Muziekkrant OOR, mainly), to get the dates right. Do you think we've overlooked a date? Leave your entry here! Any close guesses, vague memories, scanned concert tickets are welcome! The list of gigs in this section are mostly taken from concert lists or advertisements in various music magazines. If the concerts actually have taken place is uncertain. Therefore, the list may have some errors. Text in red refers to sources that are disputable.